The Junior Girl Scouts of Troop 10133 Social Circle presented to the City Council a proposal for their Bronze Award project, a Little Free Library to be placed in the park next to the post office. The Little Free Library would allow anyone to take a book and leave a book and will be available for anyone of any age. The program (littlefreelibrary.org) helps to promote literacy for children by making it easy to get books. The girls plan to purchase a kit for an Amish style library. The kit includes all they need to build the library and a set of books to get them started. 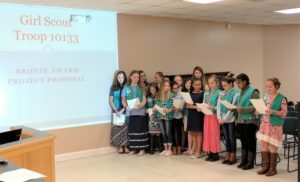 They will purchase the supplies they need for the post from Social Circle Ace Hardware. Council approved their request unanimously. They plan to have the Little Free Library in place before the end of the school year. South Cherokee Road between Spring Street and the Bypass will be closed on Monday, February 20, starting at 8:00 am so that trees near the entrance to Marco Estates can be removed. Roads should be open again by 4:00 pm. The following map shows where the road blocks will be located (orange) and routes that should be taken to get around the road closures. Due to some major improvements at the Water Plant customers may experience some discolored water coming from their faucets. After the work was complete at the Water Plant City Workers flushed the main water line and stirred up some sediment in the pipes. The water is safe and this is a temporary condition that will clear up by the end of the day. Students from the Social Circle High School Math Club spent several hours Saturday morning at the Social Circle City Cemetery working on the headstones to help preserve them. The students were lead by Mr. Trantham, SCHS teacher and member of the Cemetery Committee, and assisted by City staff. The process started with wetting the headstones then spraying a chemical on the headstones that will kill the lichens and other growth that gets into the stones and cause them to break apart. 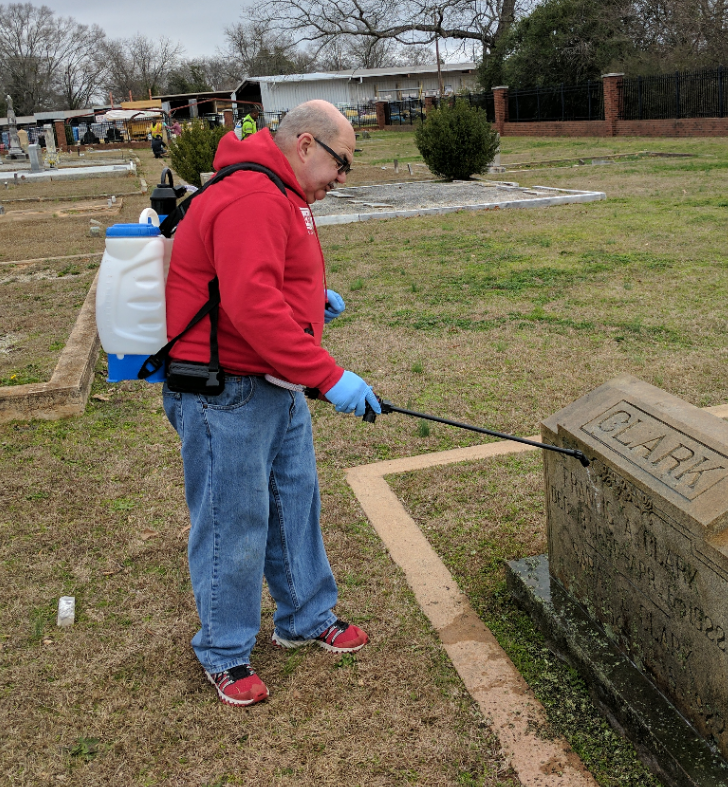 After the chemical was sprayed, the stones were scrubbed to help remove the growth and then sprayed with water to rinse away the growth and dirt. The final step was to spray the chemical on the stones to help prevent further growth. 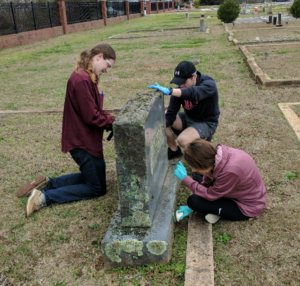 The students were able to complete about two rows of headstones Saturday morning. 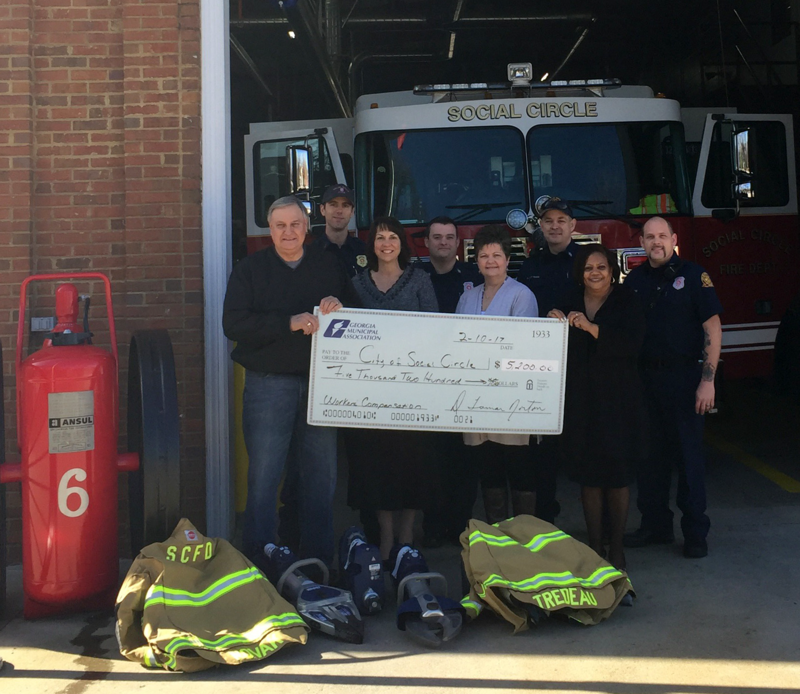 The Georgia Municipal Association (GMA) awarded the City of Social Circle a check in the amount of $5200 for the purchase turn-out gear for the fire department. 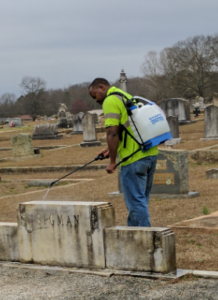 The GMA Safety and Liability Management Grant program was introduced in 2000 to provide a financial incentive to assist members in improving their employee safety and general public liability loss control efforts through training and the purchase of equipment or services. 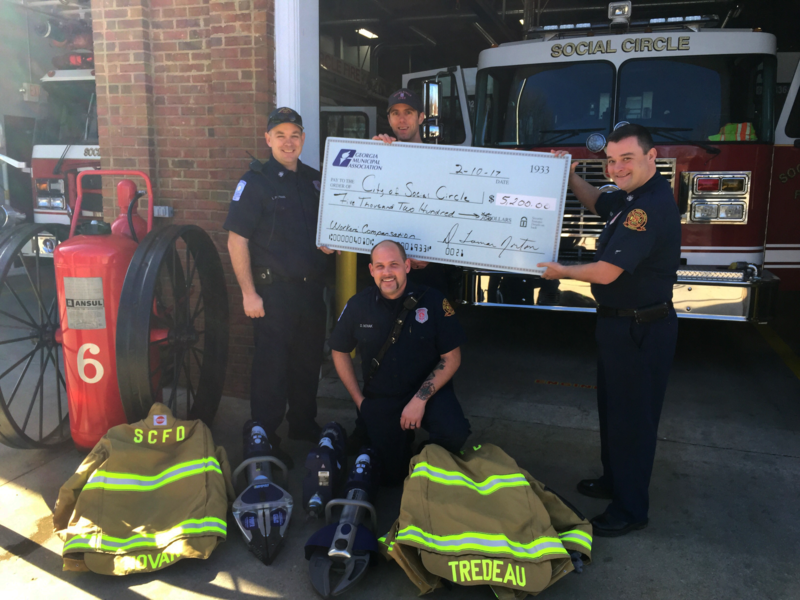 Since the inception of the program, over 130 cities have received grant money through the program, over 500 grants were approved totaling nearly $1.5 million to fund items such as bulletproof vests, training videos, confined space entry equipment, reflective safety vests, fire department turnout gear and police department in-vehicle video systems. These grant funds have helped leverage the purchase of over $2.6 million in this type of equipment training. Based in Atlanta, GMA is a voluntary, on-profit organization that provides legislative advocacy, educational, employee benefit and consulting services to its over 500 member cities. The Fire Department also used a grant from the Walton County Healthcare Foundation to purchase the Jaws of Life. Our town is quickly outgrowing our library and they are working on plans to expand, but they need your help. A State Capital Outlay Grant is needed to complete funding for the project. 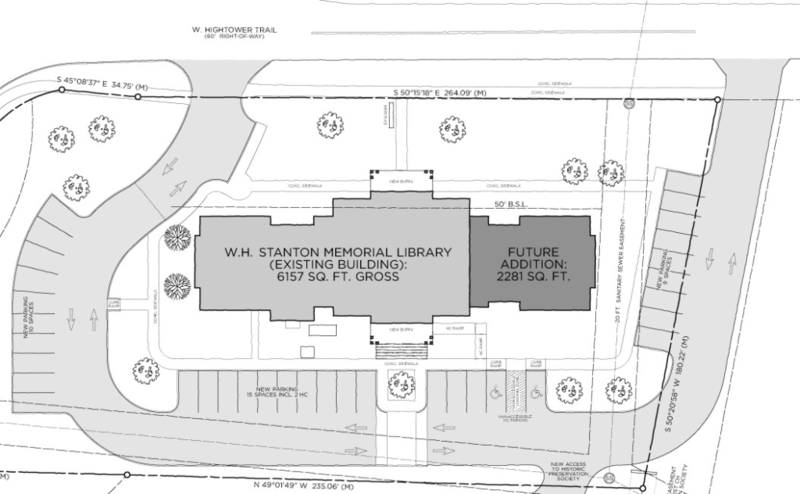 The expansion plans include adding space for more library materials, making the library more accessible, and renovating for technology use by patrons. You can help by sending emails or letters of support to our representatives. Although the recent rains have put a significant dent in the current drought by filling our reservoirs and streams, the State of Georgia has not issued an official update to the current drought conditions. We will remain in Level II Drought Response. The recent heavy rains are creating some water-related issues within the City that you can help with. During heavy rain events, ditches and storm drains become full, and sometimes will cause localized flooding of roads and yards. This can be caused by a lot of rain in a very short time, or debris such as leaves and brush being washed into the drainage system causing it to clog. The city makes every effort to keep problem areas clear and clean of debris. We are in the process of improving some problem areas by increasing pipe size and removing built up sediment in ditches. However, citizens can help by keeping their ditch lines and driveway culverts clear of debris. A special note: Please keep away from culverts or storm drains especially during heavy rain events. Water is a powerful force and can easily sweep anyone off their feet, especially a small child. It is important for every residence in the city to ensure that the cover on their sewer clean-out is in place. This keeps rain from entering the sanitary sewer system and causing unnecessary costs related to the treatment of rain water. On January 17, 2017, the Social Circle City Council adopted the amended golf cart ordinance. This ordinance allows motorized carts, aka golf carts, to be operated on city streets with speed limits not to exceed 35 mph. 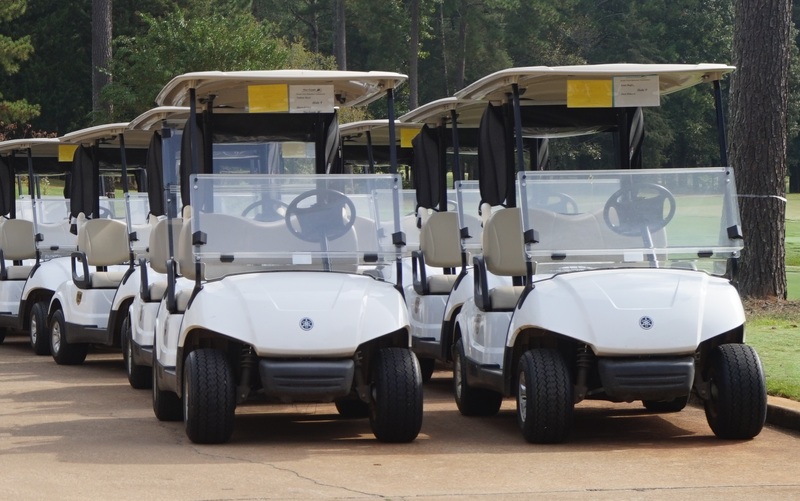 If you own a golf cart and wish to operate it on public roadways, the golf cart must be registered with the city and must meet all safety requirements defined in the ordinance. Registration packets can be picked up at the police department Monday- Friday between 8:30 am-5:00 pm or downloaded from our web site. If you have any questions, please call the police department at 770-464-2366. The South Walton Villas Apartments is currently accepting applications for available one and two bedroom units. Rent is based on income ranging from $425 to $605. 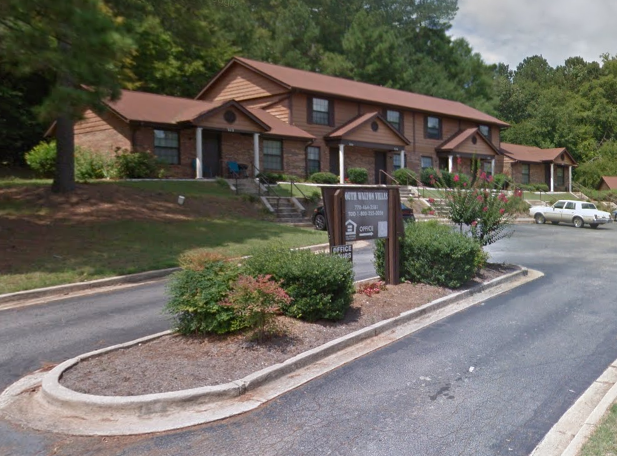 Apartments have central heat and air, are cable ready, carpeted, energy efficient, handicap accessible and adaptable. The apartment complex is federally funded and assisted by RD-USDA and is designed to provide housing for low-income families and individuals. Equal Housing Opportunity. AdvancED, the largest community of education professionals in the world, is a non-profit, non-partisan organization that conducts rigorous, on-site external reviews of Pre-K-12 schools and school systems to ensure that all learners realize their full potential. 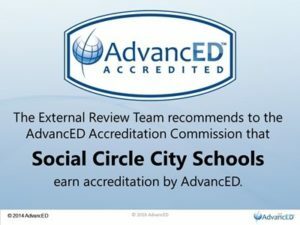 With more than a hundred years of work in school accreditation, AdvancED’s goal isn’t to certify that schools are good enough, but to help schools improve. The accreditation process includes collecting student performance data, creating a quality improvement plan, and demonstration of compliance with AdvancED, government and partnership requirements. An external review provides the school system with findings on Powerful Practices, Opportunities for Improvement, and Improvement Priorities. The accreditation is valid for five years.